As part of their incredibly exciting comeback in 2015, we've been expecting Blur to play a few huge summer festivals and the first has just been confirmed: Benicassim. Damon, Graham, Alex and Dave will join a huge line-up that already includes Noel Gallagher's High Flying Birds, Florence + The Machine and the Kaiser Chiefs. Jamie T, The Prodigy and Portishead have already been confirmed as playing the festival, which takes place in the Recinto de Benicassim in Spain on 16-19 July. 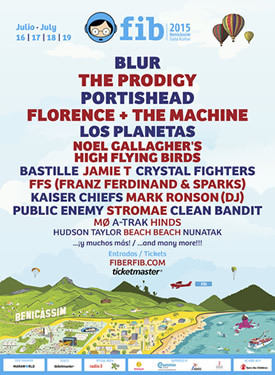 Tickets are available through Ticketmaster and fiberfib.com, the official festival site. Blur's only other confirmed date for this summer so far is their huge Hyde Park show on 20 June. Their new album The Magic Whip is out on 27 April.